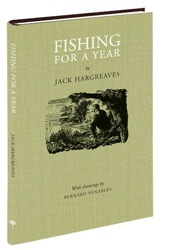 It's June, and after the 16th why not try a bit of fly fishing for dace, as advocated by Jack Hargreaves in Fishing for a Year? 'Because these sketches add up to an argument for general angling right round the year, and because the hope is to tempt many specialists to experiment with different kinds of fishing, we may as well begin just before midsummer when the great army of coarse-fishermen get out their floats and bottom-rods. And straightaway we will try to persuade them to try something else instead. 'It is true that coarse-fishing legally begins on the 16th of June and that, in the lakes and canals, the tench and carp are ready to be angled for; but in the rivers the roach are still haunting the weeds. It is hot weather, perhaps, and bright water. The underwater vegetation is swarming with larvae and shrimp and snails. Most of the fish are burrowing there and can't be reached with an underwater bait. Hargreaves follows this with a very simple introduction to fly-casting for those who have never tried it: 'It takes one day to be able to cast well enough to catch fish and enjoy yourself'. If you haven't already got this book in your fishing library, it's really worth considering - a wonderful read.